The Titron DTS is the latest in the treatment of disc buldges and herniations. The discs in the human spine have very little blood flow and receive all of the nutrients that they need via a pumping mechanism from walking and exercising. 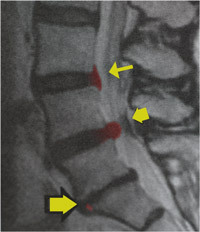 When a disc herniates and becomes inflamed the body reduces the movement of that disc creating muscle spasms. The DTS uses a sustained traction and also varies the amount of pull on the disc to recreate the pumping action to restore nutrient flow to the damaged disc which promotes healing. The DTS table can also be used to treat cervical disc problems. The treatment is completely free from the use of drugs or surgery. The treatment consists of sessions that last 10 to 20 minutes. Depending on the severity of your particular problem, the frequency of treatments vary. Anyone suffering from low back pain and thinks that surgery is the only option then you should ask the doctors at Klaes clinic for a better non-surgical option.